SUMMARY: This Airborne BSA is in very good running order. I’ll tell you everything I know about it. I’m not an expert, but I’ve cross-referenced its details with ones I’ve owned previously and I think my description is accurate. It’s a particularly interesting example because of its original paint and visible original transfers. It’s an early single seat tube model, as denoted by the frame number and the brown shade of khaki paint. The frame number is R18270. The brakes and levers are correct. The front wheel is the original BSA airborne item. The rear wheel currently fitted is not the original one, as it has been replaced with a later wheel with Sturmey Archer 3-speed hub. The gear trigger on the handlebars has been painted green to blend in with the bike. It rides very well like this; using it cross-country with the advantage of gears, it’s probably as close as you could get to a vintage mountain bike. The original BSA rear wheel is included in the sale. The previous owner used to re-fit the original rear wheel when displaying the bike at shows. Tyres are period style tread and are in good usable condition. Pedals are fitted rather than the original pedal bars; this was common practice after the war. If you’re not wearing army boots, the wartime pedal bars are not suitable for riding. 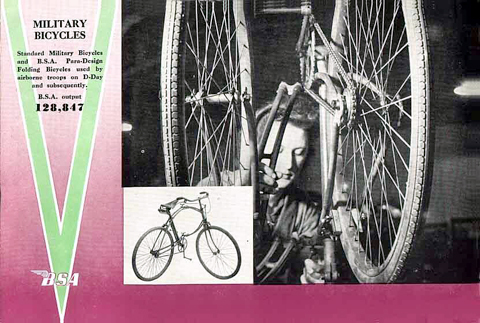 Companies that sold army surplus bicycles, such as Pride & Clark, often replaced the chain ring and pedal sets. A 44-tooth BSA chain ring is fitted. In addition, a 48-tooth (non-BSA) chain ring and chain is included in the sale, which was originally on the bike, presumably fitted in the above circumstances. It suits the single speed wheel. Extra chain links are provided too (removed to fit the 44-tooth chain ring now fitted and mated to the SA 3-speed wheel). The saddle is a Dunlop, not an original BSA. It has a period toolbag mounted behind the saddle of the type originally used. Brakes appear to be original. I believe the handlebars and levers are correct. The handlebars and bell have been repainted green, and extra matching touch-up paint is provided. The handlebar grips are not original. The front lamp bracket is original. The paint appears to be the original. Where it has worn away, in various places, a black undercoat is visible. The original front badge, which is an upright ‘broad arrow’ is still just about discernible on the headstock, just above the front forks. The original silver BSA Piled Arms badge, on the seat tube, still shows – which is quite amazing for over 60 years old. This B.S.A Airborne bicycle has the remains of yellow military markings on the off-side (right hand side). To me, this suggests that, rather than being in combat, it was used on an airfield. (Only a small proportion were actually used for their original purpose). Wing nuts and tommy bar are original. The bike folds easily. I’ve taken lots of photos, so please check the pictures yourself. Larger resolution pictures are available of particular aspects if required, if you email me (email address at bottom of page). BSA Airborne bicycles have become quite sought-after in recent years, and this one is in good operational order. If you fancy a genuine World War 2 vehicle, and with WW2 cars, trucks, jeeps and motorcycles rising in price, this model must surely represent the cheapest option. Shows, rallies, local fetes and events make an ideal family outing in the summer. Taking along a vintage vehicle is a wonderful way for younger members of the family to learn about the fascinating history of this country and contribute to the local community. It’s easy for them to do some research on the internet and make up information boards for display. it can be folded into the back of the smallest car …or ridden! What better way to introduce youngsters to our fabulous hobby? 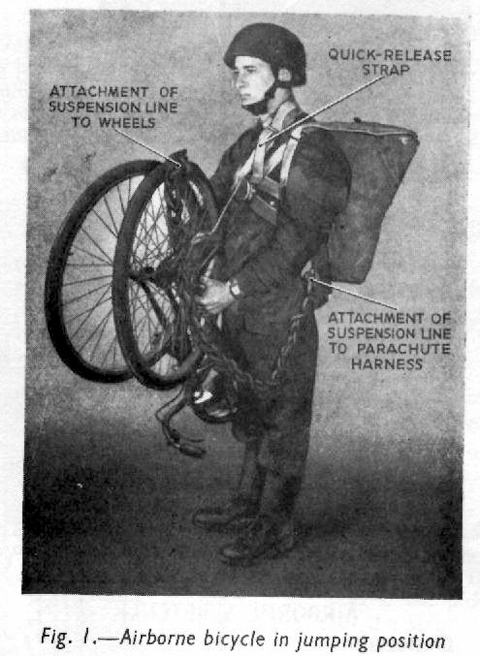 The BSA Airborne Bicycle was developed at a time when the only British Troop-carrying glider was the Hotspur. Like the Welbike, transport for the Para’s was needed that was small and could easily be transported. 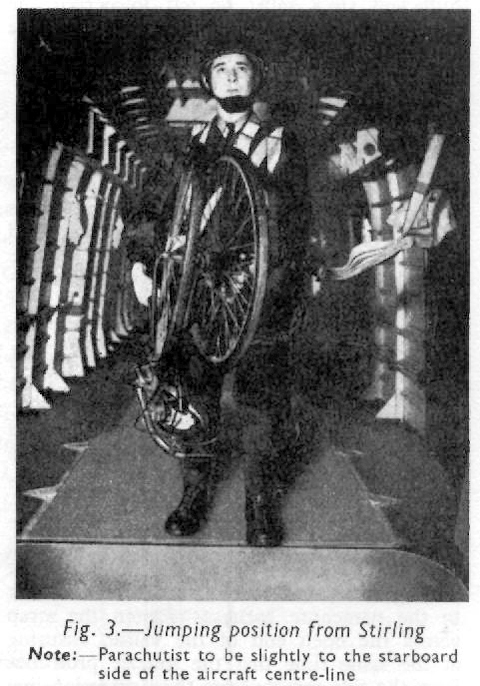 As a result, BSA, who made the M20 Motorbike, developed a bicycle that could be folded in half so a paratrooper could jump out of an aircraft with it. When folded out, it was used as a conventional bicycle. They were used in all the major landing such as D-day and Arnhem. The 44-tooth BSA chain ring fitted, above; and the 48 tooth chain ring, below, that was fitted to it after the war. Above, the steel wheel fitted with Sturmey Archer 3-speed gears. Below, the original BSA wheel with original single speed hub (included in the sale). It’s interesting to see, below, where there is black paint under the green. 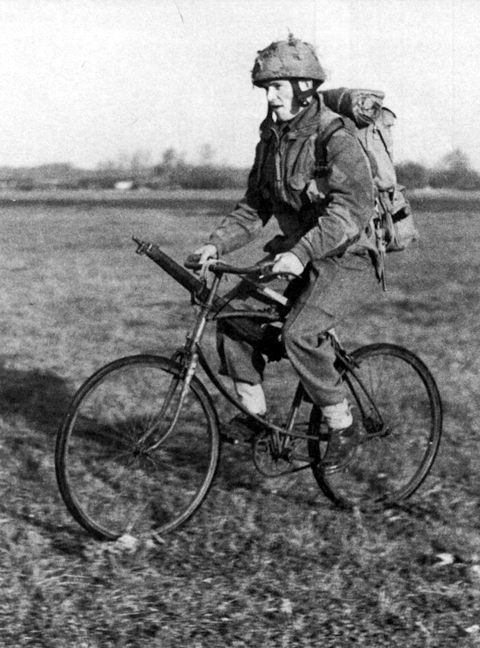 The BSA airborne bicycle was used in battle, but not as much as originally planned. The plan appears to have been that the bicycles would be mass produced and make the airborne soldiers mobile once they had landed. It was better and faster than walking. 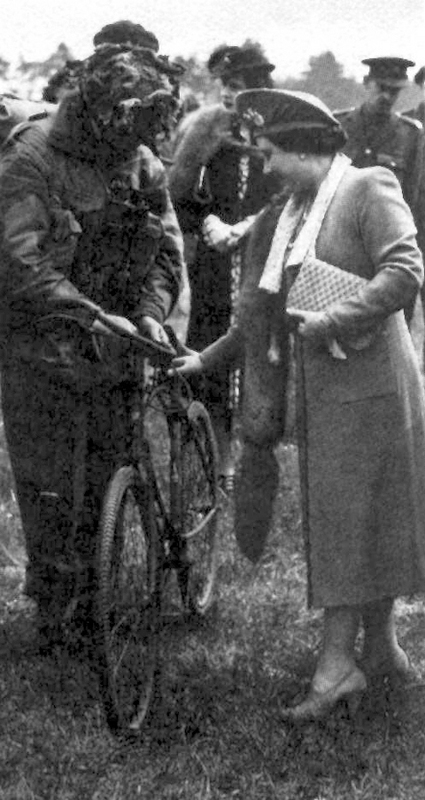 The British Airborne Forces used a few on operations, but as larger vehicles such as the jeep were available by June 1944, the bicycles were far less important. Some of these bicycles are reported to have been used on the first airborne raid into Norway, as some are reported to have been found in the wreckage of the gliders. A few of these bicycles appear in memoirs about the battles of 1944-45 and a few show up in photographs – but only a few. Most photographs show them being used in training. 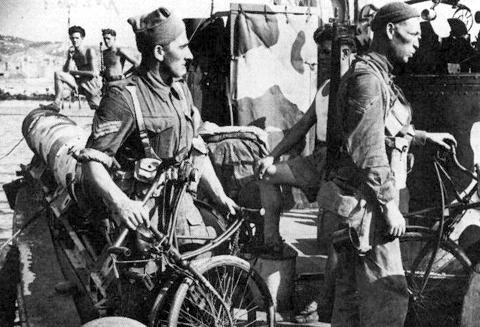 Ironically, when the airborne did use bicycles in great numbers on the advance to Wismar in Germany in 1945, they had to use captured bicycles! Photographic evidence shows that some Canadian and British troops in armoured vehicles acquired BSA airborne bicycles and hung them on their vehicles, apparently for use as runabouts when time and circumstances permitted, just as owners of Recreation Vehicles (RVs) park the big beast and use smaller vehicles to running about on errands. Photo location is Ashcombe Toll House, which was constructed around 1820 at the eastern end of what was the Lewes-Brighton Turnpike (pictured below in 1951).